Jetzt soll Mazedonien auch noch in die NATO, nachdem man korrupte Georg Soros Gestalten installiert hat, was den totalen Ruin des Landes bedeuten wird, wie man an Albanien und Montenegro sieht. In Mazedonien laufen seit langem Interventionen des Westens. Der EU Kommisar Hahn ist dort der eigentliche Chef im Lande. Anerkennt Parlamentsentscheidungen ..oder auch nicht. Verschiebt Wahlen oder setzt Neuwahlen an. Ohne ihn hätte sein Parteifreund Hahn damals die Grenzsperre für Flüchtlinge nicht befehlen können..
Soros und das CIA waren heftigst beteiligt (finanziell) am quasi Umsturz bei dem auch die Albaner gekauft wurden. ehemalige oder aktuelle Geheimdienstchefs gekauft wurden etc etc. Da gab es sogar Anfragen von einigen US Abgeordneten ans Representantenhaus um Aufklärung der Mittelverwendung. Ja klar um Nato. Es ist ja offenkundig,dass die USA(Nato) Serbien einkreisen und in die Knie zwingen will,damit man die US/Natoherrschaft am Balkan komplettieren kann.. Im Kosovo steht jae US Militärstation der Gegend. dann geht es auch wieder einmal um Gas.. Die Vorgängerregierung war damals für south stream oder auch für die Verlämgerung der turkish stream von Türkei-Griechenland- Mazedonien-Serbien und weiter in den Norden….. der damaklige Oppositionsführer und jetztiger Regierungschef war strikt dagegen und für US LNG von einem Adria HUB. Kassandra visited Skopjie briefly on Wednesday and had lunch with two good old friends. Both former Foreign Ministers of the Republic of Macedonia, FYROM according the Greeks, but this does not make any difference to the story although the Greeks, not Greece, have a leading role in the play. What is the story and what the Greeks have to do with it? 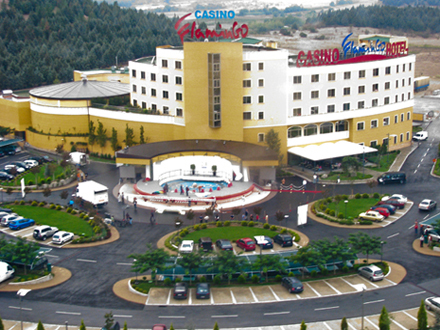 Gevgelija Casinos is the main issue of the story and the Greeks happen to be the gamblers. There are two big casinos in Gevgelija, a town on the Greek-Macedonian border. In both casinos (which are on the FYROM side) the clientele is Greeks who are not allowed (by law) to play in the Greek casinos and spend their week-ends (and their money) in Gevgelija to gamble and be entertained – a decompression from the ongoing Greek crisis. The Flamingo Hotel is touted as the top casino, owned by Novomatic which is managed by former Formula One driver Niki Lauda. The other is owned by Swedish interests but is seems it has some kind of problems as is subject to all kind of daily controls by the authorities. The Flamingo has top quality management and has, according to sources, never had any serious government audits or controls; “obviously it is impeccable in every aspect” said the source ironically. Perhaps Austrians are experts in casinos and always do things right. Indeed, thanks to the Austrian expertise, the understanding of the government of VMRO in Skopjie and the Greeks donors, The Flamingo has proved to be a great investment! During Kassandra’s lunch in Doirani restaurant (which serves top quality grilled meat) we learned that the Friday before, Commissioner Johannes Hahn arrived in Skopjie on an official visit, in a flash trip of 6 hours. Hahn concluded that everything is fine and the country can go to elections; easy and safe. Hahn’s statements provided important support to the stability of the country which was welcomed by most foreign investors. By the way, in a nearly unbelievable coincidence, according to Kassandra’s source, Niki Lauda was on the same fight that brought our Commissioner to Skopje. Lauda left from the airport directly for Gevgelia, contrarily to our Commissioner who went directly to the offices of the EU delegation. On this occasion Kassandra should add that the Representation office must be heavily understaffed as there are several stories in the local media about the casinos “of Brussels interests” which are not translated from Makedonski because of the lack of translator. It is a pity, because the stories are often also accompanied by pictures. According to the official biography of Commissioner Johannes Hahn, from 1997 to 2003 he worked as a member of the board of directors of Novomatic and one time served as CEO of the company. The shareholders of the Flamingo Casino and Novomatic are currently not known to the public.